Items can removed from clear plastic display box and arranged on table, tray, etc. Foundation bottle is 1/4 x 1/4 X 3/8 inch (6 X 6 x 10 mm). 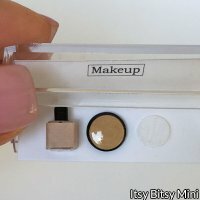 Pressed powder compact 3/8 inch diameter (9 mm). Velvet pressed powder puff 5/16 inch diameter (8 mm). One inch Scale.